The league is starting to shape very nicely from a Hearts perspective. To have a five-point cushion over the fourth-place team and be within two points of second is quite a feat after 12 games of the season. Saturday’s result was a perfect way to build on the win at Dundee United, and once again we showed our strength of character in kicking on to score again after having a man sent off. Callum Paterson set us on our way with a great goal but I was particularly pleased for Osman Sow to get on the scoresheet as a reward for his excellent efforts in recent games. It might not be the most spectacular goal he’ll ever score but he looks like he’s hitting a bit of form and getting to grips with the Premiership. Arnaud Djoum’s debut was also encouraging – he looks like a very good addition. If he can maintain that level of form, the management are going to be spoilt for choice in central midfield. In defence, it’s ironic that we’re now keeping the back door shut at a time when our defence seems to be changing every week. The unsettled nature of the back four is now going to continue after Blazej Augustyn’s sending off. It makes you wonder just how solid we’ll be once we get everyone fit and free of suspension at the same time and are able to have a bit of continuity in that area. As a team, we’ve recovered really well from the sticky patch we had in September and, after going five games unbeaten in all competitions, we now we have a run of league games that look winnable on paper, starting at Partick on Saturday. Before that, though, we have a formidable League Cup tie at home to Celtic. I always view the cups as a bonus, and we’re certainly in a bit of a no-lose situation this week given that we play a team who go into every game in Scotland as red-hot favourites. 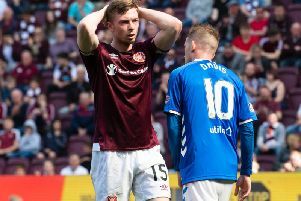 Having looked at the way things have gone recently, though, if Hearts are able to put in a performance, I wouldn’t be overly surprised if we were able to get the better of them. It will need a big effort and more of the type of resolve that Hearts showed in killing off Ross County with ten men.